TitletownTech has hired Breakthrough Fuel founder and UW-Green Bay alumnus Craig Dickman ’82 (Business Administration) as the innovation center’s managing director. The Green Bay Packers and Microsoft made the joint announcement Wednesday, Sept. 26, 2018. 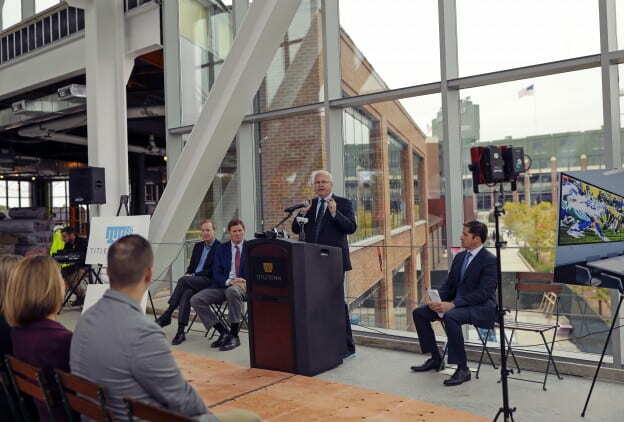 The Packers with Microsoft Corp. announced operational details of the joint venture, with plans to bring world-class digital innovations and expertise to Greater Green Bay. The program and state-of-the-art building located immediately west of Lambeau Field, are to open in early 2019. UW-Green Bay is a partner. A venture fund, focused on funding and investing in high-growth startups aligned with industries in Northeastern Wisconsin that will bring opportunity to the region. Dickman is highly involved in his alma mater, UW-Green Bay, and has been active in support of campus and community initiatives. His philanthropic pursuits are behind recent upgrades and renovations of the Cofrin Library and its “Breakthrough ® Studio” space and the At Ease Veteran’s Lounge. Chancellor Gary L. Miller presented Craig Dickman, UW-Green Bay Foundation Board and Council of Trustees member, with the 2015 Chancellor’s Award, the University’s highest community honor. This entry was posted in Alumni Rising and tagged alumni, alumni association, Business Administration, Cofrin School of Business on September 21, 2018 by Sue Bodilly.